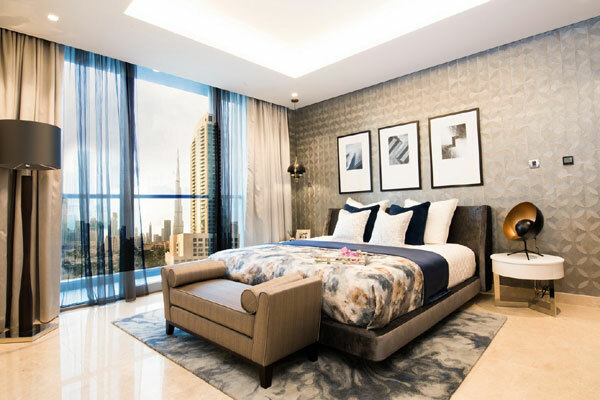 Dubai-based ultra-luxury developer Omniyat unveiled a new show apartment within its key development, The Sterling to give an exclusive preview of its twin tower project in Downtown Dubai which is scheduled to be completed by the year-end. Nestled between the Burj Khalifa District and Dubai Water Canal, The Sterling by Omniyat is a premium residential project made unique by its twin towers dubbed as East House and West House. The development offers spacious studio, one-, two-, three-bedroom, and penthouse units with impressive amenities, said the developer in a statement. The Sterling guarantees privacy and serenity and is designed to exude luxury lifestyle and enhanced living experience, it stated. The high-ceiling building features marble flooring and marble walls in the kitchen, bespoke crafted wardrobes and walk-in closets with integrated lighting and full-height mirrors; contemporary Italian kitchenware; a master bathroom with full marble finishing equipped with rain shower and bath; and an intelligent home automation system, said the statement. These features and more are integrated into all the residential project’s one-of-a-kind units, it added. Peter Stephenson, the executive director for development, said: "The show apartment serves as a glimpse of our craftmanship and meticulous attention to detail at The Sterling. Like our other projects, The Sterling brings living in a bespoke space to another level by partnering with the globally renowned architects and designers to produce a project unique to this region." "Each tower will have a 30-m outdoor swimming pool with wet deck lounge; two beautifully landscaped gardens with seating and entertaining zones; a multipurpose room opening onto the podium garden; and fully equipped gym and changing room. It will also offer 24-hour concierge, security, and valet services," explained Stephenson.